Pes anserine bursitis is a common sports injury, occuring at the knee joint. Generally caused by overuse,bursitis occurs at the numerous joints in the body, and commonly occurs in runners, as well as with basketball, football, and soccer. Pes anserine bursitis is an inflammation of the pes anserine bursa in the knee. This bursa, or fluid filled sack sits along the inside edge of the knee, just below the knee cap and knee joint, and helps reduce the friction between the tibia and the tendons that attach at this site. 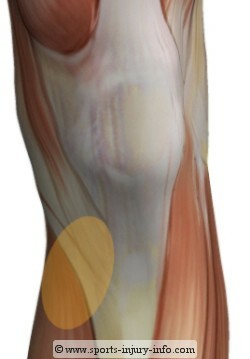 The pes anserine tendons include the Sartorius, a muscle that runs along the inside of the thigh, the Gracilis, another inside thigh muscle, and the semitendinosus hamstring tendon. Each of the tendons attach at the medial or inside portion of the tibia. The pes anserine bursa sits between the tendons and the bone, and helps prevent excessive stress on the tendons. Overuse, or excessive stress of the knee joint can sometimes lead to pes anserine bursitis. This can occur at the beginning of an athletic season, or at any time during the season when the body is being worked beyond its capacity. Runners may suffer from this if they significantly increase their milage, change shoes, or have worn out shoes, or change the surface they are running on. Other causes of pes anserine bursitis may include tight muscles, especially those mentioned above. Weakness, or muscle imbalance may also be a culprit for causing this injury. This injury usually presents itself with pain along the inside of the knee, usually worsening with activity or with prolonged time on the feet. You may experience swelling, or puffiness around the inside of the knee, and it could be tender to the touch. Depending on the severity of the inflammation, it may also be warm to the touch, when compared to the other knee. Discoloration or skin changes are uncommon with this type of injury. As with any type of bursitis, in order to treat the injury successfully, you must limit the inflammation occuring at the joint. This is best accomplished by the R.I.C.E. principles. 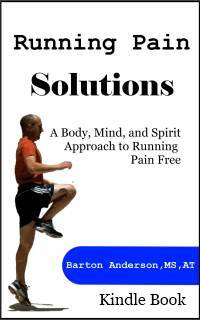 Resting the knee from stresses by limiting aggravating activities will help to reduce the pain. Application of ice after activities or when sore can help reduce pain and inflammation. Elevation may be beneficial if there is significant swelling, however this is not common. The same applies for compression. Anti-inflammatory medication may also be of benefit. With any type of overuse injury, finding the cause is the most important part of the treatment. If you cannot determine what is causing your pes anserine bursitis, then it will most likely return once you get back into your activities. Generally, hamstring stretching, as well as stretching of the calf and adductor muscles will help to reduce the stress on the tendons inserting at the pes anserine, thus limiting the stresses on the bursa. Make sure that your athletic shoes are appropriate for your foot type and your activity, and that they are not worn out, as this can cause undue stress on the knee. Gradually increase your activity. This is especially true if you are starting a season, or beginning something new, such as running, basketball, soccer, etc. Starting out at too high of an intensity or to long of a duration can over stress tissues. Give your body time to accomodate to your activities. Pes anserine bursitis is a common sports injury, involving inflammation of the pes anserine bursa of the knee. It can be caused by poor flexibility, improper or worn out shoes, muscle weakness or imbalance, or overtraining. Treatment consists of rest, ice, possibly anti-inflammatory medications, and addressing the underlying causes.